The installation has become a much-favored place to relax and contemplate nature from a bird’s-eye view. After a period of being closed off to the public due to damage, Martin Puryear’s Pavilion in the Trees (1993) is open once again! 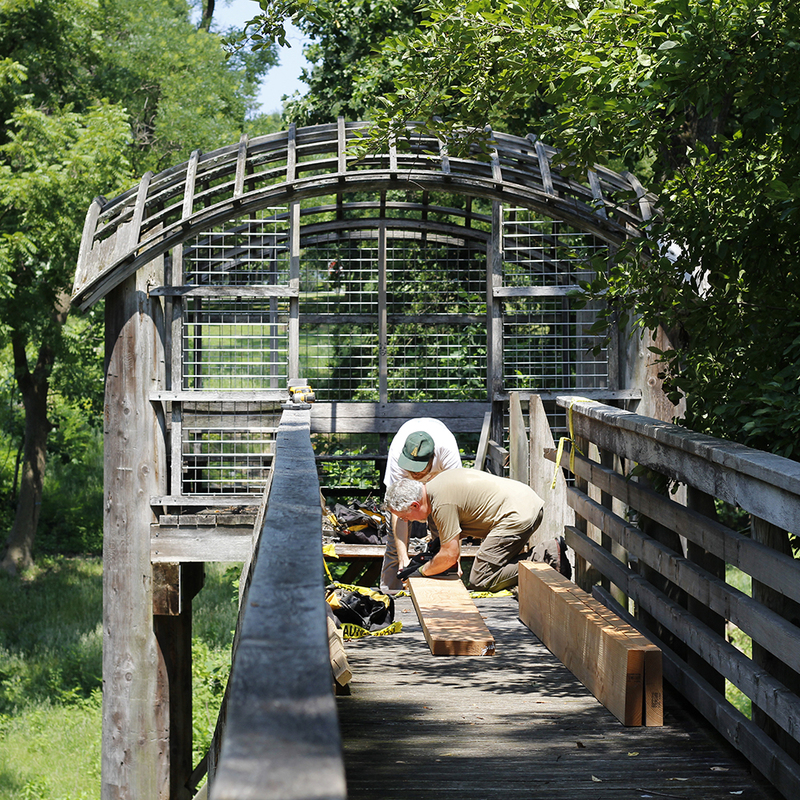 Located near the Horticulture Center in Philadelphia’s West Fairmount Park, the installation recently received major repairs to the sixty-foot walkway that leads to an observation platform, after it was severely damaged when a tree fell on the structure during a storm in late 2017. Working with the Association for Public Art, a conservation team from Fairmount Park Conservancy rebuilt the walkway, and the amenity is now accessible for visitors to enjoy. All damaged wood was removed and disposed of, and the structure was thoroughly inspected. Conservators salvaged any reusable materials and installed new white oak deck boards, top rails, cedar side rails and hand rails. Pavilion was then sprayed with an organic material that protects against deterioration. Many are familiar with Puryear’s massive Big Bling (2016) sculpture, which was installed along Philadelphia’s Kelly Drive from June – November 2017. Using similar materials found in Pavilion in the Trees, Big Bling’s abstract form elicited many interpretations. The Association for Public Art (aPA) worked with New York’s Madison Square Park Conservancy in a first-time collaboration to bring the sculpture to Philadelphia as a temporary installation. It was originally commissioned by Madison Square Park Conservancy, New York, and was first exhibited by the contemporary art program, Mad. Sq. Art. Martin Puryear’s Pavilion in the Trees was conceived in 1981 as part of the Fairmount Park Art Association’s (now the Association for Public Art) Form and Function program. The structure was built in 1993 and is located near the Horticultural Center in West Fairmount Park. Puryear worked with architect Samuel Harris, at the time of the firm Kieran Timberlake and Harris, to realize the project which was supported by the Pew Charitable Trusts, the National Endowment for the Arts, and the Pennsylvania Council on the Arts. Pavilion consists of a sixty-foot walkway that leads across a natural basin to an observation platform – a square deck covered by a latticed canopy – that rises twenty-four feet above the ground. Puryear was inspired by the universal longing for a tree house which reflects in the artwork’s location high among the treetops. The installation has become a much-favored place to relax and contemplate nature from a bird’s-eye view. 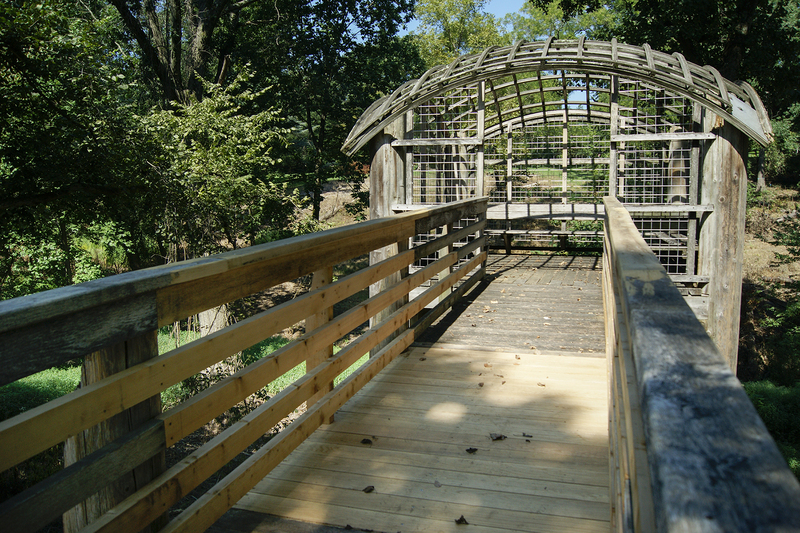 A sixty-foot walkway leads across a natural basin to an observation platform – a square deck covered by a latticed canopy – that rises twenty-four feet above the ground.